Crankbaits like this one, with its short bill, are designed to swim near the surface. Ranking among the most common fishing lures in the world, crankbaits are hard-bodied baits, usually made of plastic or wood. Though they're usually associated with bass fishing, crankbaits are available in a tremendous variety of shapes and sizes. 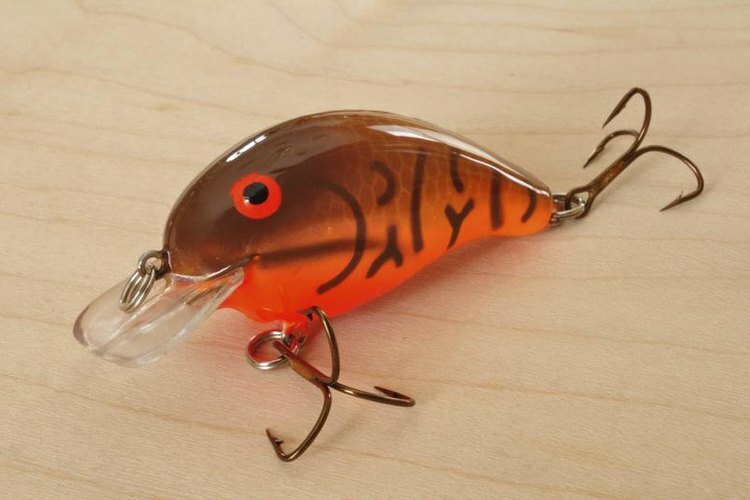 Crankbaits measuring 10 inches or more are commonly used for pike and muskie fishing, while tiny 1- and 2-inch crankbaits excel at tempting trout and panfish. A small selection of crankbaits can have you covered in most fishing situations. As a general rule, larger crankbaits attract larger fish, and mid-sized lures work in the widest variety of situations. When it comes to color, look for lures that imitate native bait fish in the water body you're fishing. A basic silver and black pattern is a good catch-all if you're not sure. The most important consideration of all is depth. Crankbaits are designed to dive to a specific depth, and you can usually find this information on the packaging when you purchase a lure. When in doubt, look at the bill or lip at the head of the crankbait. Baits with a long bill are usually deep divers, while those with a short, stubby bill stay close to the surface. Diving crankbaits are a natural fit for fishing deep water, though floating and shallow-running crankbaits are also useful when game fish suspend near the surface. When you're fishing in deep water, you can use a crankbait as a search tool, moving your boat slowly with the trolling motor and casting over a wide area to find fish. If you have a topographic map or sonar unit, you can also use a crankbait to fish specific areas that are likely to attract fish. Crankbaits are effective around deep bottom structures like sloping points, rock piles, reefs, shelves and drop-offs. When you're fishing around deep weed beds and aquatic vegetation, try to use a crankbait that dives down to a depth just above the tips of the weeds. Shallow-running crankbaits are useful for fishing in shallow water, including fishing from the shore or a pier. Cast shallow crankbaits as close to cover as you can without getting snagged, retrieving the lure along the edges of docks and weed beds, or between submerged rocks or stumps. The bill on a crankbait helps it deflect hard objects, but these lures can easily get tangled up in weeds, brush and tree limbs. Fish sometimes strike a crankbait when it pauses briefly after bouncing off a rock or stump. Another common method is to choose a crankbait that dives to a depth slightly greater than the actual depth of the water. When retrieved, the lure will bounce and vibrate on the bottom, kicking up debris and attracting actively-feeding game fish. Crankbaits are designed to move like a live minnow when you do nothing more than cast in a straight line, and sometimes this is all you have to do. More often, however, you can make a crankbait more effective by adding twitches and pauses to your retrieve. Experimentation can be the key to success. If you're using a floating crankbait, the ripples created by a stop-and start retrieve can draw fish toward the surface to strike. Some crankbaits are designed with neutral buoyancy, which means that they will hover in place, neither sinking nor rising, when you pause the lure. These suspending baits are very effective when fish are wary and unwilling to bite a fast-moving lure.